Do you have specific photos that you’ve taken that you just love? Perhaps you knew in the moment the shutter clicked that you had made a great photograph. Maybe your heart leapt when you saw it appear on your computer during download. It could have even been an accident. There are a few frames of mine that are favorites – something about them just speaks to my soul. The photograph below is of my niece, Adelaide, and was taken a couple of years ago. I love her expression. I love the way the light hits her in almost Rembrandt-like manner. I love the canes and the wallpaper of Dave’s grandfather’s home in the background. But what makes this photo even more special to me is the way it tells the story of our family’s life at that moment. Adelaide’s mother had just poured her a snack. 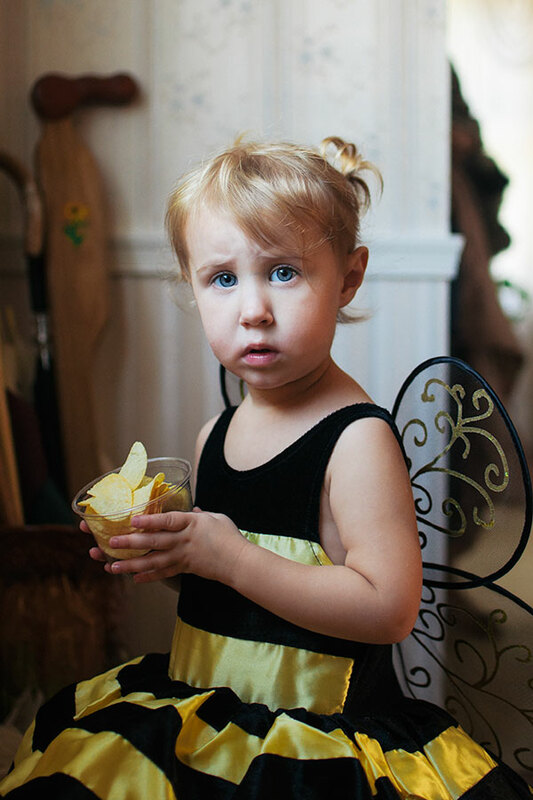 Her grandmother had just dressed her up in a new bee costume. Her great-grandfather’s canes are stacked up behind her…Her family was in the room behind her gathered around her great-grandmother as she battled cancer. Adelaide was such a balm for the soul as we all dealt with the reality of losing a loved one. There is something so healing about the innocence of childhood and the comfort of family. I think that’s the story of this photograph. To be honest, I knew I would love this image forever the moment the shutter clicked.